The Self-evaluation and Holistic Assessment of climate Resilience of farmers and Pastoralists (SHARP) was developed in 2013 with the aim to help smallholder farmers and pastoralists assess their climate resilience and facilitate discussion between community members on ways to increase resilience. SHARP works as a participatory survey, either paper based or through our Android application administered with tablets. SHARP assesses climate resilience at the household and community level based on 54 questions spanning environmental, social, economic, governance and agricultural practices. Each question combines an academic assessment of resilience with a self-evaluation of adequacy and importance by the farmer/pastoralist. The SHARP team has also been working in a project in Southwestern Angola for 6 months and has been compiling initial reports based on information on climate resilience gathered from communities in the project region. Population: Twenty individuals were interviewed in rural communities in Virei, Bibala and Camucuio (Namibe province) out of which 20 percent are women and 80 percent men. Educational levels in the population are low; only about 11 percent of the respondents has received formal education. The diet of population of the surveyed communities relies heavily on meat (80 percent), eggs (60 percent) cereals (50 percent), tubers, milk and cereals (40 percent); while the consumption of fruits, vegetables, fish and oil is rather small (around 25 to 30 percent), suggesting a low-varied diet, and being the cause of a low Household Dietary Diversity Score (HDDS). Economy and production: Ten agropastoralists (50 percent), six farmers (30 percent), and four pastoralists (20 percent) were interviewed in Namibe. 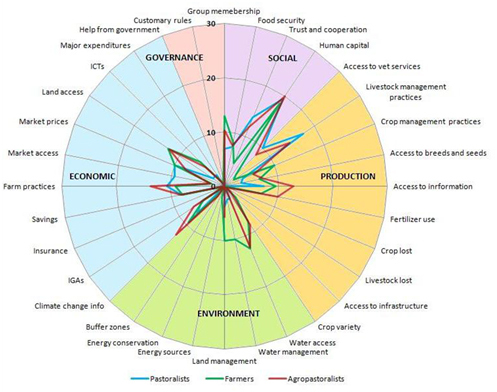 Livestock, crop production and poultry are the major agricultural activities practiced within the group surveyed. For own consumption (subsistence farming) is the main purpose of production of 75 percent of farmers, pastoralists and agropastoralists and only about 25 percent of producers have market-oriented purposes. Environment: 90 percent of the population has access to water and about 57 percent to land. Nonetheless, the use of sustainable management practices for land and water is not widespread among the population. Climatic conditions: The most observed disturbances in the area are a decrease in rainfall and late rainfall onset (70 percent) together with an increase in the temperature (80 percent). This condition might raise the likelihood of experiencing severe droughts and water scarcity, affecting the community's livelihoods and farming systems. Limited access to local markets and scarce information on prices make producers vulnerable to unexpected shocks in prices and limit their ability to make their system profitable enough to meet their own needs. Increase access to and improve quality of information on market prices for inputs and agricultural products when trading. More data is being collected in Angola which will be analysed to prepare further community detailed reports for project staff and facilitators in the project. The SHARP team is working in collaboration with two further projects in Angola to organize further training and implementation of SHARP in 2015. In 2016, further countries will join as the tool has been included in a number of climate resilience projects throughout sub-Saharan Africa. The team is currently also looking for opportunities to expand the use of SHARP to other geographic areas in order to perform broader level analysis and comparison of data across different regions and farming systems. A further development is the partnership with the Pastoralist Knowledge Hub, a portal for knowledge sharing on pastoralists across different regions of the world. SHARP will have a dynamic website modelled after FAOstat where users will be able to compare farmer/pastoralist (anonymous) data disaggregated by region, agricultural practices and gender, among others.